Pink Dolphins were first observed in the waters around Hong Kong and the Pearl River Estuary over 300 years ago, but it wasn't until the late 1980's that anyone really started paying attention to them. It was with the start of the new Chek Lap Kok Airport construction project that the rare Chinese dolphin came in the radar of the Hong Kong public. The huge land reclamation project affected the area in Northern Lantau Island, one of the major habitats of the dolphins. The public outcry and media attention helped to get the Hong Kong Government and other environmental groups to start funding research projects for this endangered and understudied species. In 1997, the Pink Dolphin or Chinese White Dolphin became the official mascot of Hong Kong's handover to China during the Sovereignty Changing Ceremonies, beating the Giant Panda. 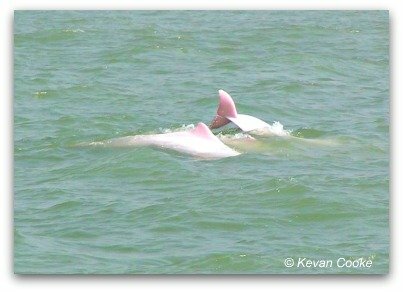 Pink Dolphin is the common name for the Sousa chinensis also known as the Chinese White Dolphin. Is it pink or is it white? Adults of the species can be either white or pink. Newborns are black and they slowly turn grey. Young ones start developing spots, then later, turn pink or white when adults. 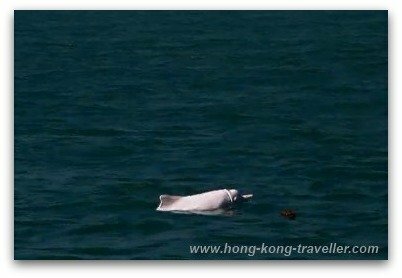 The White Chinese Dolphins found in the waters around Hong Kong are notably of the pinkish variety. What makes this Rare Dolphin pink? Unlike flamingos which get their pink/reddish colors from their diets, not enough is known from the Pink Dolphin and whether their color is derived from their nutrition. It is believed that their pink skin is due to the blood vessels which are in the outer layers of the skin, as they regulate their body temperatures and excess heat is flushed out producing the blush color. Around Hong Kong waters they live in the north and southeast of Lantau Island and around the smaller Peng Chau Island. Although studies are inconclusive, it is believed that the dolphin population in Hong Kong waters is only about 100-140 dolphins and perhaps about 1,000 in the Pearl River Delta. Boat traffic: Amongst the fishing vessels, containers, cruise ships, ferries, barges, tug boats, etc. it is estimated that over 70 vessels come back and forth every hour through these waters. Although efforts are being made, including a scheduled ban for trawling in Hong Kong waters as of 2012, their population is clearly in danger. Many groups are actively working to protect the Dolphins, including Hong Kong Dolphinwatch and the Hong Kong Dolphin Conservation Society (HKDCS). There are regularly scheduled dolphin watch cruises year-round, organized by Hong Kong Dolphinwatch on Wednesday, Friday and Sunday. This is not only a way to enjoy and observe these lovely creatures in the wild, but also to take a little break from the hectic pace of the city and see a bit more from the surrounding areas. 96% of trips have successful sightings. If there are no sightings on the trip, they offer a free cruise on the next available date. The cruise takes about 3-4 hours plus time for transportation from certain area hotels to Lantau, an additional hour.